We're celebrating Meatless Mondays with balanced, delicious meal plans. We hope you'll join us -- whether you're vegetarian all the time or just here and there. Today: Pappardelle is so fancy (you already know). Papparadelle is sumptuous; it just lounges and flops on your plate as if it were reclining on a chaise lounge in an evening gown. 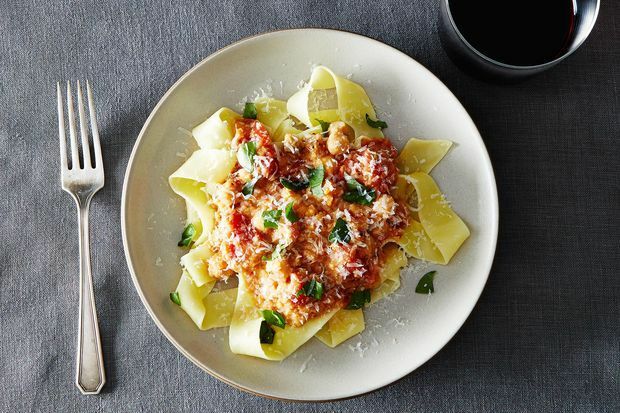 And when you eat pappardelle, even if it's a weeknight, you'll feel luxurious, too (especially if you make a slightly crunchy, very tomato-y chickpea bolognese to top it). If you have any leftover sauce, save it for later in the week -- it's a great topping for polenta, rice, or cooked vegetables. You'll start by steeping dried mushrooms in boiling water; let them soak while you start on the sauce. Process roughly chopped onion, celery, carrots, and garlic in a food processor until you have a chunky mash. Sauté canned chickpeas on the stove, add the processed vegetables, some herbs, and the rehydrated mushrooms (chop them and reserve their soaking liquid). Next, add in crushed tomatoes, wine, and the reserved mushroom liquid. Bring the sauce to a simmer, partially cover the pot, and leave it alone for an hour. 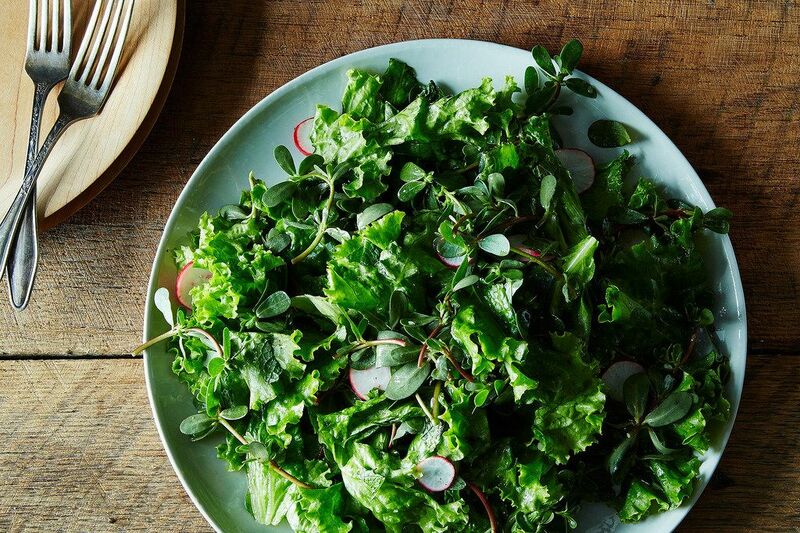 While the sauce cooks, clean up the kitchen, set the table, and start on your green salad. Wash and dry your greens of choice, make a quick vinaigrette, and chop any vegetables that won’t be sad sitting out for a bit. When the sauce is almost finished, cook a pound of pasta until al dente. Meanwhile, blend about half of the sauce in a blender or food processor until it’s broken down. Add it back to the pot, along with some cream or half and half, and return it to a simmer. Season and stir in fresh herbs. Toss the salad and plate the pasta, ladling sauce over top. Take advantage of our handy grocery list and click the recipe photos or titles to see (and save and print) the full recipes. We're omitting the pancetta to make this dish vegetarian. Salad add-ins: additional vegetables, cheeses, herbs, nuts, etc. We assume you have garlic, extra-virgin olive oil, dried oregano, crushed red pepper flakes, salt and pepper, 1 pound of dried pasta, and ingredients for a simple vinaigrette. If not, add those to the list. Huh. I'd never considered chickpeas in bolognese before, but thinking about it, it sounds awesome. Also, you're right. Pappardelle is like instant luxury.